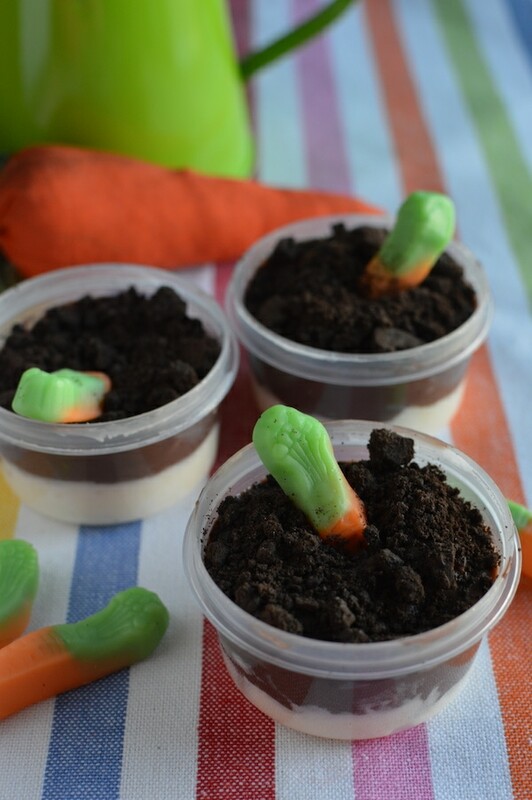 This carrots in dirt cups recipe are super easy to make and are toddler-friendly. I want to say that right off the bat because I know that sometimes when I go online the holiday craft ideas I find are a bit above my family’s paygrade. Not this Easter food craft!! Anyone can do it! Even my husband! I’m just teasing, Bill. He’s a rockstar in the kitchen. 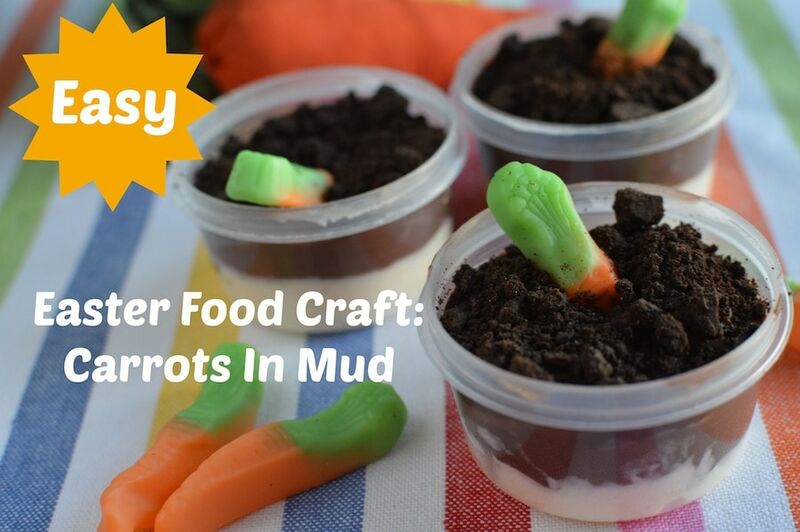 🙂 But seriously, folks, you only need a few items to recreate this carrots in dirt cups recipe! And you don’t need to turn the oven on – BLISS! Easter is right around the corner and this EASY food craft is just perfect for little kids. Grab some crushed up Oreos, a few pudding packs, and a handful of gummies and you will be ready to party. LOVE LOVE LOVE! Place some vanilla pudding in the bottom of your container / cup. Then place some chocolate pudding on top of your vanilla. Here’s a little secret from me. Most of the time, I really don’t care about mixing two different puddings and messing up a clean container in my house. I just buy a pre-made pudding from the store. Jell-O has some. Swiss Miss is another option. Then I just rip open the top and I am halfway there with this recipe. If you want to feel like you’ve done MORE with this recipe, then don’t buy your pudding packages already set up. But 9 times out of 10, that’s the route I take with my kids. Ok, next up, you need to crumble your Oreo cookies. But first, you need to get rid of the middle. I usually let the kids twist open the cookies and then we just each grab spoons and scrape off the centers and save them for another craft. Do not just toss the Oreo centers away. That is the best part in my eyes. Throw all the cookies in a Ziploc bag, close it up and crush all the Oreos. This is the dirt. You can’t have a dirt cup recipe without any dirt, right? LOL! But our dirt cup recipe tastes delicious! Last but not least, you want to pop your gummy carrots in your dirt – one or two at most per container. If you need to push the Oreos around your gummy to cover it up more, go right ahead. Work your magic until it looks like your carrot is completely planted. And serve immediately! Your kids will get a total kick out of this treat. 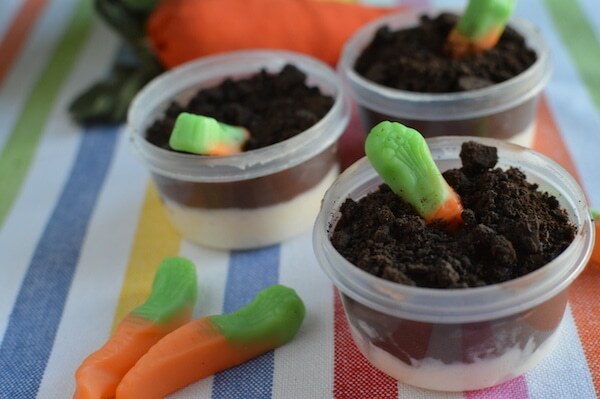 What do you think of this Easter dirt cup recipe? I just love it. It’s something really fast you can do after school or on the weekends. Looking for more things to do with your kids? Try these Easter egg nests, or this Easter caramel corn.